The official report date for Yankees' pitchers and catchers is tomorrow, but next Wednesday might be the biggest media day for all of spring training. Why? That's the day Alex Rodriguez is due to report. "Quoting Rodriguez is like dropping a Mento into a Diet Coke. It makes a big whoosh, everyone gets excited, for about three seconds, and then it's just a mess, and you wonder what's been accomplished, besides some stickiness, and maybe a permanent stain." For more excerpts, here's the obligatory Deadspin response piece. Next up is quite the opposite. After A-Rod released his handwritten apology note, New York Daily News columnist Mike Lupica went on a complete tirade against our man of the hour. While both of these are must-reads, Craig Calcaterra over at Hardball Talk took a moment to call out Lupica for being "petty and mean." Oh, and about that letter. 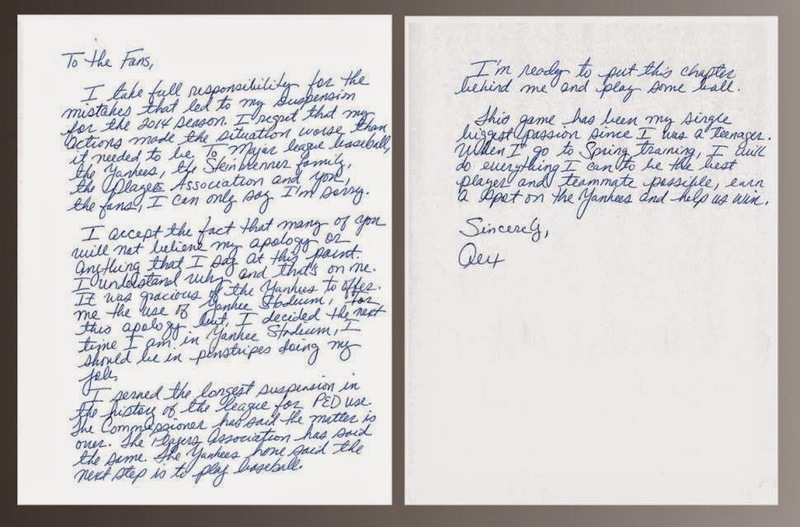 Here's A-Rod's letter read aloud by a comedian in Morgan Freeman's voice, here's a handwriting expert's analysis of the letter from the Wall Street Journal, and here's a handwritten letter from a fan responding to A-Rod. Lastly, Anthony Bosch was sentenced to four years in prison for his role in MLB's Biogensis scandal. How does that relate to A-Rod? While A-Rod has never gone on record about their exact relationship, Bosch's lawyer put A-Rod on trial at Tuesday’s hearing. Hope you enjoy today's reading, class. The A-Rod Test is scheduled for a week from today, when the media has surely bashed A-Rod once more.